I don’t know about you but weeknights at my house are crazy! I’m constantly on the look for new weeknight meals that go beyond my boring staples and aren’t labor intensive to prepare. 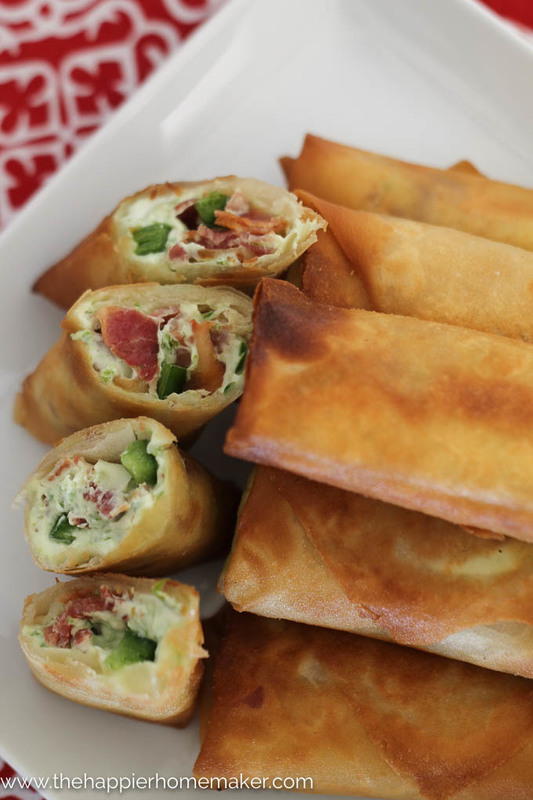 When I was brainstorming I came up with the idea for Bacon Jalapeño Egg Rolls using cream cheese and bacon. Y’all-they were so good I had to share the recipe with you! 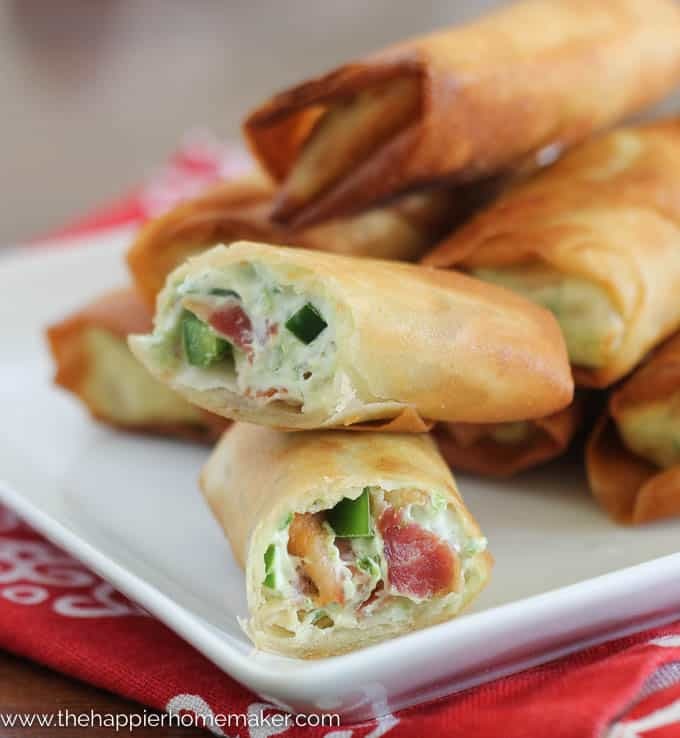 These Bacon Jalapeño Popper Egg Rolls were super easy to whip up quickly on a weeknight (and filling enough to make a meal of) or they could easily be served as appetizers or finger food for the football game on the weekend! Best of all, they only require four ingredients! 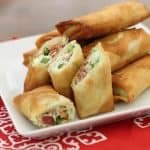 Perfect for an appetizer or easy weeknight dinner, these bacon jalapeño popper eggrolls are easy to make and only take 4 ingredients! Combine cream cheese, jalapeños, and bacon in a food processor and pulse until fully blended. 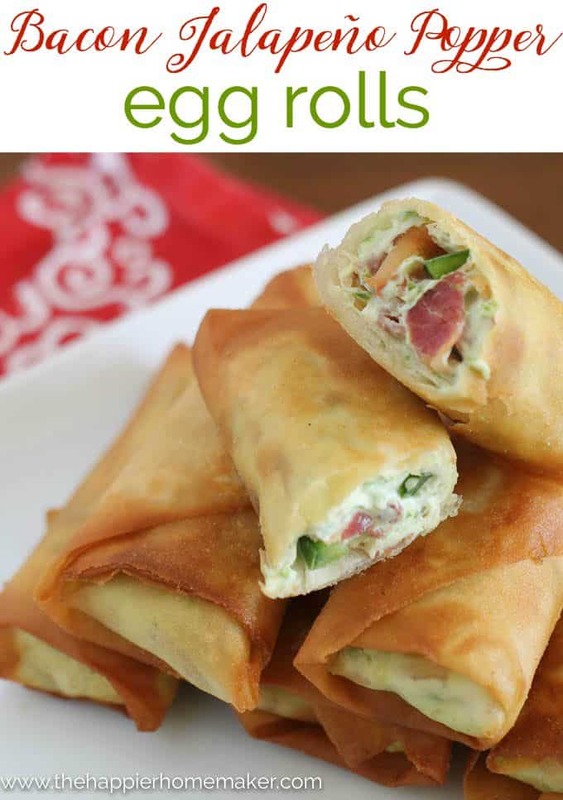 Spread about 2 tablespoons of cheese mixture on egg roll wrapper and roll up. Heat 1/2″ oil in a skillet over medium heat and carefully add egg rolls, seam side down. Flip when golden, about 2 minutes. Fry an additional 2 minutes and remove to a paper towel-lined tray. These can also be made ahead of time and reheated for 12 minutes in a 400-degree oven. Please let me know what you think of these once you try the recipe out, they are seriously one of my absolute favorite recipes I’ve created here on the blog!